BD Veo U-100 Syringes 31g 3/10cc 6mm (90 count) are the shortest, most innovative syringe needle ever designed - for maximum comfort. 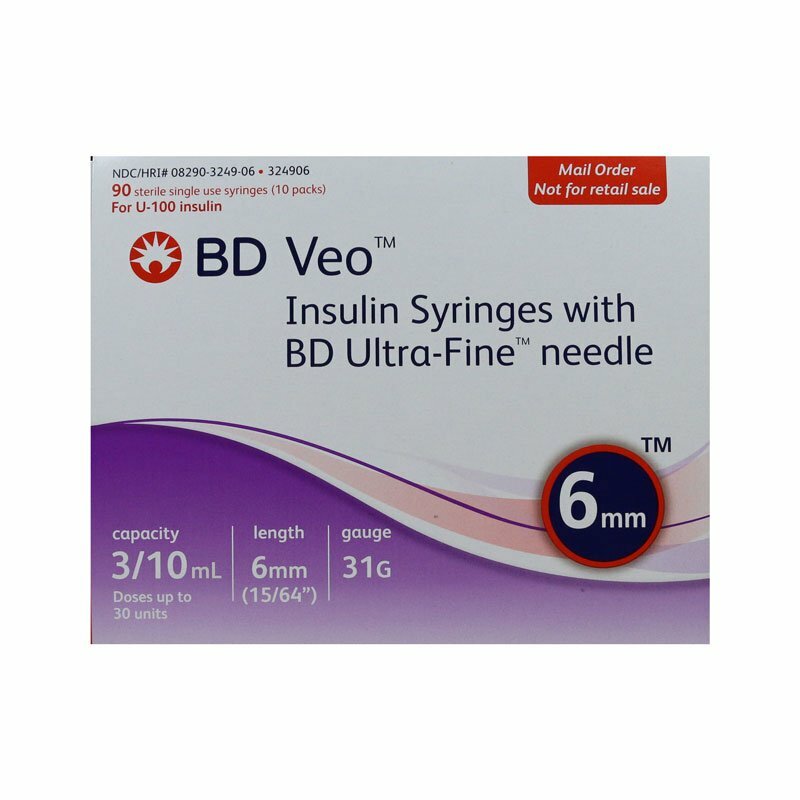 The BD Veo Insulin Syringes 31G with Ultra-Fine Needle (90 count) are the shortest, most innovative insulin syringe needle ever designed - for maximum comfort. Bought BD syringes because of it's short needle 6mm is hard to find. However after used several boxes I found these 6mm syringes did not lubricate well. For about 2-3 syringes in a bag are very poorly lubrcated and very hard to push. And even found some syringes has bended needle which caused pain in my baby dog. I have to throw these problem syringes away. Consider BD syringes has only 9 bags in a box this is not acceptable. I don't want my baby cry so I'm looking for other brand syringes to replace BD. I have to give my chihuahua 2 shots a day for diabetes. Even after 3 years, I hate doing it. These needles makes it so much better for both of us. Our Bichon Remy, has to have 2 shots each day. I’m so glad we are able to get the shorter needles from you. And they get here so fast. So glad I found Adw! I use these needles for my diabetic 9 pound Yorkshire Terrier and they are perfectly small for her small size. Price is almost half of the best chain pharmacy, and I’ve shopped them all for price. Quick shipping, totally happy. This is the place to go for diabetic supplies. One of my dogs has diabetes and requires two shots a day. I got tired of having to run out all the time to get more syringes. ADW delivers right to my front door and I can select how often they come. I also needed help with figuring the size of needle and their customer service was most helpful. Need diabetic supplies? Try ADW - you won’t be disappointed. My cat, Harold needs shots two times a day. These needles are so fine that Harold does not even flinch at the shot. I like the needles as they are easy to read the dosage level. Excellent customer service and delivery. I am always so surprised how quickly the orders arrive. My Rocky has to take shots 2x a day he is small dog (min pin) I just wanted a syringe that would be gentle and I am glad I found BD 31 gauge less pain sometimes he never even feels it thank you! The 2mm shorter length of this needle compared to the former shortest needle option of 8mm makes so much difference in comfort. Additionally, it being the BD brand with the quality plunger components makes it great!